The maiden (and, so far, only) foray into visual media by California death metal trio Deeds Of Flesh embodies a lot, if not all, of what is wrong with mid-level label sanctioned extreme metal DVDs in general. Despite having a respectable setlist “Live in Montreal” shortsells the band, label, and genre in many ways. The DVD is low on worthwhile content and substantial features. The live portion, supposedly the product’s main selling point, of the DVD was recorded at Le Petit Campus, Montreal in 2004 – a student club that goes by the name Café Campus nowadays, has several notable defects. The package appears to be hastily thrown together in order to capitalize on the DVD craze. Sadly “Live in Montreal” screams amateur hackjob from each, and every party involved in the production of this package. The main feature, and lion’s share, of the DVD is a live show from the Canadian leg of the “Reduced to Ashes” global touring campaign. The show in question was recorded at Le Petit Campus, Montreal in 2004 – a student club that now goes by the name Café Campus. It was shot on regular video since it was produced before the advent of High Definition, as a result the image quality tends to get grainy on larger screens. A single, mounted camera positioned in the middle of the venue was used to capture the show. Although there are a decent amount of wide, medium and close shots – all of it is just basic zooming. Since there are no actual close-up shots its impossible to see any of the rapid picking during the more intricate parts of the songs. Those expecting to see up-and-close drumming action are left wanting as there is no dedicated drum cam. This means that there are no shots whatsoever of Hamilton’s impressive stamina and endurance, and his nearly constant double bass footwork. 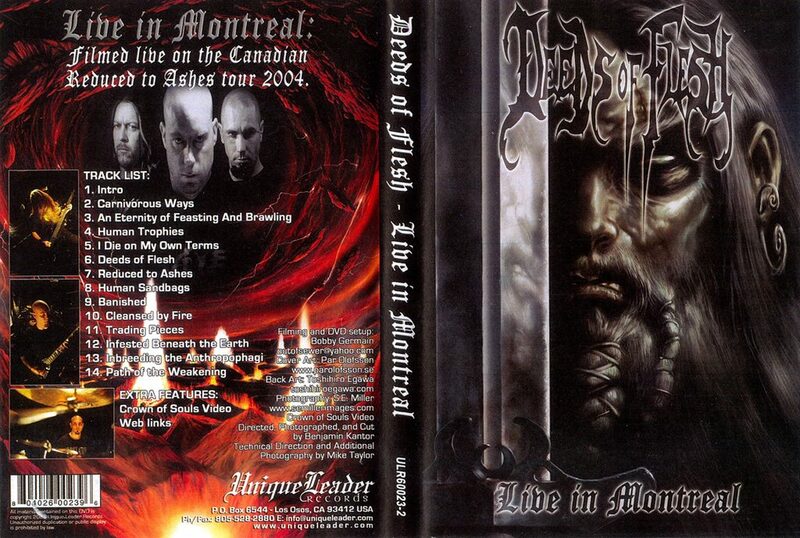 Truthfully, not all blame is to be placed at the director for “Live in Montréal” as Deeds Of Flesh themselves didn’t seem to have put any additional effort whatsoever in making this DVD special or different from similarly poorly put together packages in any conceivable way. There is no stage design (backdrop, banner, flags, or other props) to speak of – and there’s a complete lack of notable production values beyond the bare-bones capture of a live show. The setlist is a representative cross-section of the band’s catalog with only “Inbreeding the Anthropophagi” getting but a single track. The ominous introduction track, using a Christopher Young piece from the “Hellraiser II: Hellbound” soundtrack was a nice, but ultimately futile, effort on part of the band. While a live recording was indeed pined for the lack of extra features and worthwhile content is what make “Live in Montréal” as ill-conceived as it is. Even the sound options appear to be shortchanged. There are no sound options worthy of the name, and playing the DVD is only possible in basic stereo – forgoing the Dolby Surround 5.1 that was considered the widely accepted standard even by the time this DVD saw release. The main menu is beyond basic, as there’s no possibility to play just the show (discounting the “song selection” option, which isn’t the same thing). The DVD includes the official music video for ‘Crown Of Souls’ from the record of the same name. Curiously it omits any and all of the band’s prior music videos for the earlier albums. Specifically ‘Reduced to Ashes’ (from the album of the same name), and the unreleased ‘Indigenous To the Appaling (Mutinous Human’) from “Path Of the Weakening”. The ‘Crown Of Souls’ music video, directed by Benjamin Kantor, displays the sort of creativity that the rest of the DVD, in both content and presentation, sorely lacks. The “extra features” include the music video for ‘Crown Of Souls’ and the obligatory (and therefore instantly redundant) weblinks. That the latter was even touted as a feature was unforgiveable even by 2005 standards. The most damning aspect about “Live in Montréal” is that it has no additional bonus content besides the already very paltry so-called “extra features”. No new artwork was allocated to make the DVD a recognizable stand-alone release. It remains puzzling as to why the Viking warrior artwork by Pär Olofsson from the “Crown Of Souls” album was reproduced in full as “Live In Montréal” has no connection to that release. The backsleeve, understandably, reproduced the cover artwork from the “Reduced to Ashes” album by Toshiro Egawa in full. This is only logical as it was that effort the band was promoting at the time of this DVD’s shooting. A lot of more care and effort should have invested on this DVD release. 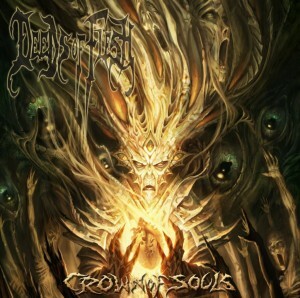 “Crown Of Souls”, the sixth Deeds Of Flesh record, marks the end of an era for the band. It was the last to feature founding member Jacoby Kingston (vocals, bass guitar), and it would be the last in its characteristic percussive direction. The album follows the template laid out by the preceding two records, but offers little novel in return. Its consistency is both its forte and its detriment. The trio deviates not an inch from its established formula, and “Crown Of Souls” is thus reliably percussive. The internal stability had resulted in a consistent level of quality in its output, even though cracks started to appear in the foundation. More than anything “Crown Of Souls” conclusively proved that the band’s recently adopted linear direction had ran its natural course. From “Mark Of the Legion” onward the band adopted a more linear style, especially in terms of drumming, that it perfected with this final installment of the second trilogy. “Crown Of Souls” takes that direction to its logical conclusion, and clearly reveals the imposed limitations that “Reduced to Ashes” already hinted at previously. 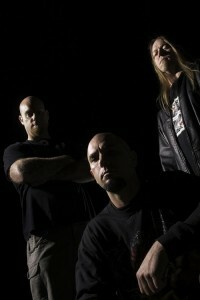 The album is the last in the band’s second era as after its release Deeds Of Flesh underwent a transformation in terms of line-up and overall direction. Telling is that “Crown Of Souls” actually regresses back to the band’s earlier days lyrically. ‘Crown Of Souls’, ‘This Macabre Fetish’ and ‘Caught Devouring’ are all quite trite examples of the gore subjects that the band had abandoned previously for more compelling subjects. Thankfully the rest of the record deals with far more interesting subject matter. ‘Medical Murder’ details the atrocities committed by Nazi doctor Joseph Mengele during World War II and it is custodian to the band’s characteristic bass breaks at various points. ‘Hammer-Forged Blade’ deals with Viking conquest, and contains the expected sword sample. ‘Forced Attrition’ is another track dealing with the horrors of warfare. ‘The Resurrected’ concerns Haitian zombieism, and its voodoo culture. ‘Incontestably Evil’ is about the trangressions and deviances of Roman emperor Nero. ‘Crimson Offering’ chronicles Aztec history, specifically the 1487 re-consecration of the Great Pyramid of Tenochtitlan, in which an estimated 80.400 people were sacrificed. The regression that “Mark Of the Legion” introduced, and “Reduced to Ashes” persevered with finally catches up with the trio – and “Crown Of Souls”, for all the things it does right, was the tipping point in its artistic decay. Thankfully the trio opted for more diversified rhythm playing and Hamilton accommodates both men with his drum work for the record. Lindmark and Kingston’s vocal interaction remains expectedly powerful and commanding, but the sheer limitation of the riff set needlessly hampers what could have been far more interesting songs with any other band. Thankfully Deeds Of Flesh always had a sense of artistry that was lost on its peers in Disgorge, but even then “Crown Of Souls” sees the trio treading water. As impressive as the music from Deeds Of Flesh is from a technical point of view - its older, more traditional writing style offered more to the listener than the linear direction that was introduced with the coming of Hamilton, and the move towards a more sterile, clinically dry production. Once again the band recorded at Avalon Digital Recording Studios in San Luis Obispo, California with Kip Stork producing. While the production is largely similar to that of “Reduced to Ashes” the drum sound has been notably improved. The snares and kickdrums don’t sound nearly as hollow and impotent as they did on the preceding album. The early albums had their own share of productional shortcomings, but at least the drum sound was always incredibly powerful and commanding. In comparison to the preceding albums the bass guitar is far more pronounced in the mix. Deeds Of Flesh commissioned artwork by multiple artists for this outing. American graphic artist Raymond Swanland rendered the cover artwork, whereas Swedish artist Pär Olofsson provided the additional Viking artwork that adorns the disc itself. In whole it is the most ambitious, and professional looking of all the band’s releases up to that point.. If anything “Crown Of Souls” proves conclusively that Deeds Of Flesh had painted itself in a corner stylistically. The album is consistent with the direction of the preceding two records, and that presents a quandary in itself. Apparently the trio was aware of this, but even the inclusion of more variated rhythms (structurally as well as in the guitar playing) can’t save the obvious fatigue of the style. As impressive as “Crown Of Souls” is from a technical point of view in the past the trio had simply presented more engaging material. The fact that they not even attempted to make its death metal sound sadistic and hateful (something which “Trading Pieces” and “Inbreeding the Anthropophagi” at least aspired to) eventually would catch up with them, and it does so here.